When our kids were little, I was always amazed at how much they would grow and change in just one year. Their physical and mental development during 12 months was always remarkable when they were babies or toddlers. Now that our three oldest kids are all in their adolescent/teen years, I am just as amazed to look back at the way they have changed in just one school year. 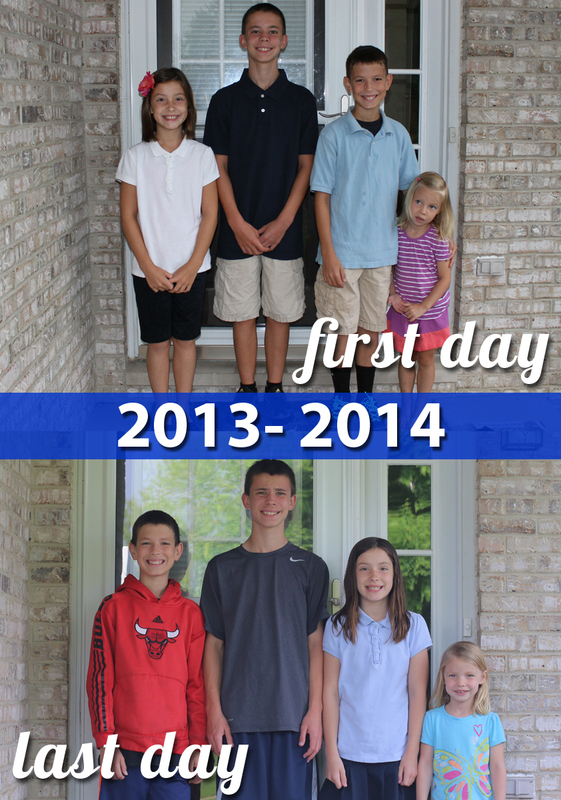 Last week, I posted this photo on Facebook of their first day of school and last day of school. I thought I had seen some big physical changes in them, but the photo proved to me that they ARE growing up right before my eyes! The changes are so much more than physical. I’ve been so impressed this year by the hard work and determination of our 13-year-old. He decided last fall that he would join the school basketball team. Although he has a lot of natural athletic ability, this is the first time he’s shown any interest in a team sport since he played soccer when he was young. Most of the other boys on his team had been playing basketball on a team together since they were in 5th grade. I remember his first game in 7th grade when we were just happy his coach put him in for the last 25 seconds of a quarter. He improved a lot during the season. But the amazing thing is how much he has improved since then. He practices in our driveway several hours a day. On the weekends, he easily practices four hours a day. He shoots. He creates drills for himself. He practices jumping. He begs other kids and even dads to play with him. 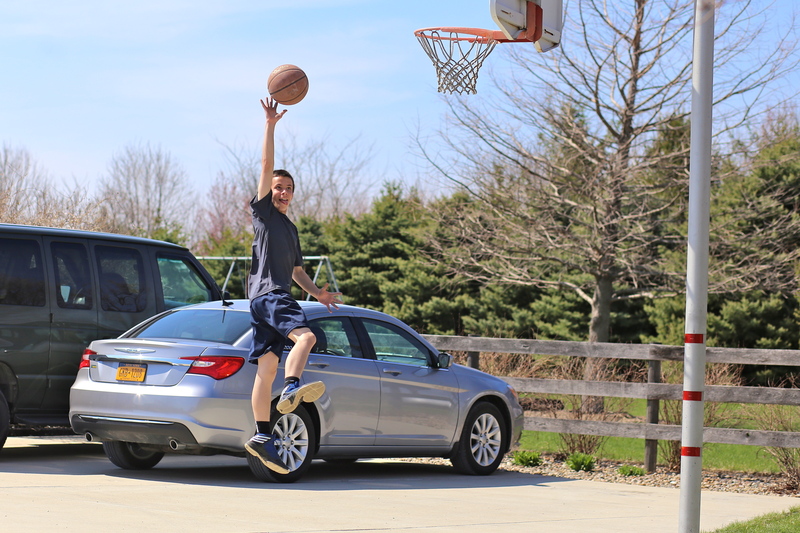 It’s fun to see how much more confident he is now playing basketball than he was at the beginning of the school year. His arms and legs are much more defined now, showing how hard he has worked. Our 11-year old’s passion is baseball. We had an interesting start to this baseball season, and without going into all the details, he joined his team right before opening day. Because he came in later in the season, it took a few games before his coach realized that this kid can pitch. He isn’t a big kid, so it’s always fun to watch what happens when he goes out to pitch against kids much larger than he is. 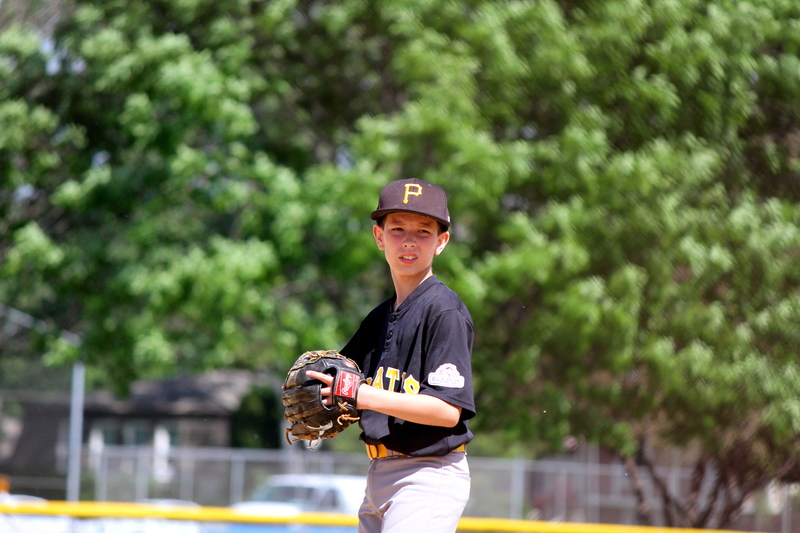 He has a natural pitching ability that you don’t see coming from a kid his size. The season has been fun because his coach now has been leaning on him as one of the better pitchers on his team. I always smile when I walk up to a game a little late and hear all of the parents and team mates cheering for my kid by name because he is on the mound. And our 9 year old also has grown by leaps this year. Literally! On Jan. 1, we all sat down and wrote out our goals for the year. 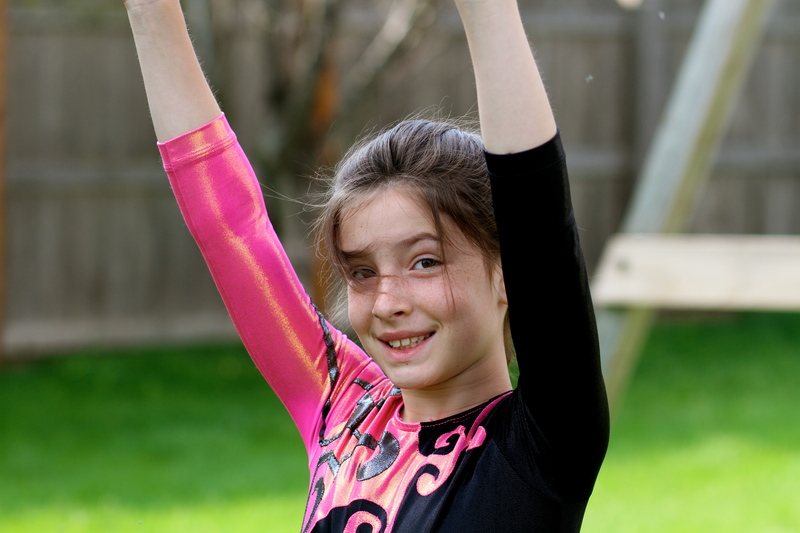 Hers was to make the gymnastics team. She has worked her little tail off to make her goal. She wears out our carpet and furniture doing flips, backbends, round offs and walking on her hands. She had an exhibition on Sunday and I cried the whole time watching her perform. I guess it’s one thing to see your child do flips in the family room. But when they run across a big mat doing gymnastics in front of a crowd with so much confidence, it’s amazing to watch. All three of our big kids also made High Honor Roll and school this year, and the two middles got to compete in the Math Olympics. I’m more proud of them though for the fact that they are just nice kids who add something positive to their classrooms. And of course, I can’t forget the 4-year-old. She is a bright spot in everyone’s day. She is always overjoyed to see me. Even if we’ve only been separated for an hour, she screams “Mama!” and jumps into my arms like we haven’t seen each other for a month. 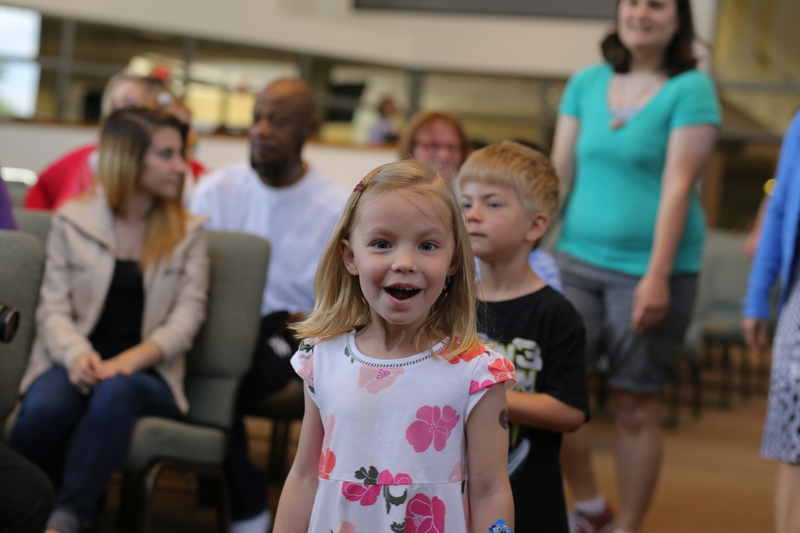 She had an awesome year in preschool, and she can’t believe she has to do preschool ANOTHER year before she can go to kindergarten. She cracks us up with the her language. Because she hangs around people who are so much older, she uses words and phrases that seem too advanced for her tiny voice. She also gets lots of words mixed up, like when she asks if her brother “took a short cut.” I’ve finally figured out this means he got a SHORT hair CUT. I don’t know what we would do without her. She brings constant smiles and laughter to our home! So how about you? Have you seen big changes in your kids this school year? What a beautiful year-end recap!!! So much to be proud of!